Digging Dolls : 30 pcs Artisan Tyrannosaurus Rex (T-Rex) Collectable Animal Figurine - Party Favors, Stocking Stuffers, Gifts, Collecting and More! The Digging Dolls Brand of stones is owned by female rock hounds who care deeply about providing only the best quality and value with the most spectacular 100% natural stones on the market. When you order any authentic Digging Dolls product you can be certain that every order has been through a rigorous quality control process and only the best products are allowed to feature our Digging Dolls logo. 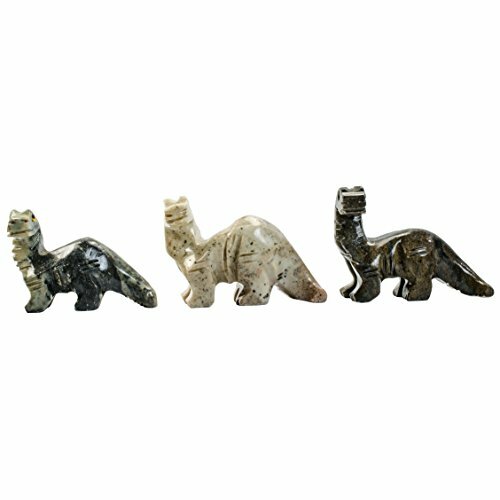 These charming soapstone animals are hand carved in Peru and carefully selected by the Dolls for premium quality. Our animals are perfect for gifts, collecting, a hit at parties as party favors, as a cute knickknack to keep on your desk or in a curio cabinet, and they can be used in a varity of craft and art projects. The average size of these animals is 1.5 inches to 2 inches and can vary depending on the individual piece. Even though all our animals are from the same litter, they are just as unique as living animals and therefore, you may recieve animals that vary in size, shape, color and carving. The most important thing to Digging Dolls is making sure our customers are thrilled with what they receive when ordering the Digging Dolls brand. Artisan Hand Crafted Figurines for Party Favors, Stocking Stuffers, Gifts and More! Perfect for kids parties, collecting, stocking stuffers, chess pieces, arts and crafts, party favors and more! Digging Dolls Authentic Carvings - As our mascot Ruby says, "We get our hands dirty, so you don't have to!" If you have any questions about this product by Digging Dolls, contact us by completing and submitting the form below. If you are looking for a specif part number, please include it with your message. Digging Dolls : 10 pcs Artisan Ram Collectable Animal Figurine - Party Favors, Stocking Stuffers, Gifts, Collecting and More! Digging Dolls : 10 pcs Artisan Bronto Collectable Animal Figurine - Party Favors, Stocking Stuffers, Gifts, Collecting and More! Digging Dolls : 10 pcs Artisan Dog Collectable Animal Figurine - Style 1 - Party Favors, Stocking Stuffers, Gifts, Collecting and More! Digging Dolls : 30 pcs Artisan Hammer Head Shark Collectable Animal Figurine - Party Favors, Stocking Stuffers, Gifts, Collecting and More! Digging Dolls : 10 pcs Artisan Condor Collectable Animal Figurine - Party Favors, Stocking Stuffers, Gifts, Collecting and More! Digging Dolls : 30 pcs Artisan Condor Collectable Animal Figurine - Party Favors, Stocking Stuffers, Gifts, Collecting and More! Digging Dolls : 30 pcs Artisan Piranha Collectable Animal Figurine - Party Favors, Stocking Stuffers, Gifts, Collecting and More! Digging Dolls : 30 pcs Artisan Giraffe Collectable Animal Figurine - Style 1 - Party Favors, Stocking Stuffers, Gifts, Collecting and More! Digging Dolls : 10 pcs Artisan Elephant Collectable Animal Figurine - Party Favors, Stocking Stuffers, Gifts, Collecting and More! Digging Dolls : 10 pcs Artisan Koala Bear Collectable Animal Figurine - Party Favors, Stocking Stuffers, Gifts, Collecting and More!